This is a 500 sq. 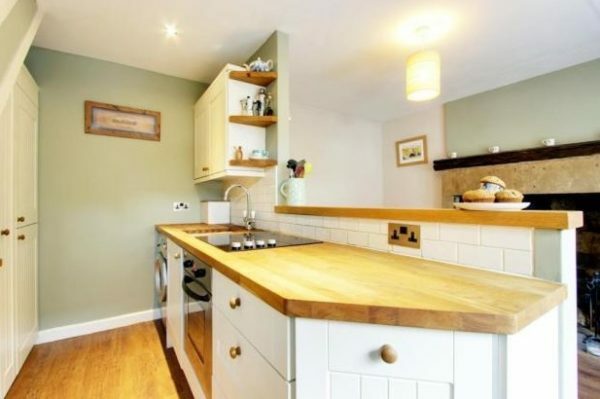 ft. cottage for sale in Yorkshire Village. From the outside, you’ll see the exterior is covered in beautiful stone. When you go inside, you’ll find a living area, kitchen, bathroom, bedroom, and an additional upstairs loft bedroom. The asking price for this home is £165,000, which is about $237,360 in USD. Please learn more at Rightmove.co.uk. It looks cute but very awkward—like it was made from left over space in a larger building. Not quite what in my mind a cottage looks like but hard to tell. Not my fave and seemingly spendy but I am not familiar with Brit real estate prices except that they seem generally higher than US for similar places. Yeah, I was expecting something a lot cuter on the inside- more “cottagey”. Do you know if there are tiny cottage in Greeley Colorado ,or in Bandenton ,Florida and how much to but?Thank you if you could send info to me to my email. I would like to see more pictures, both inside and of the outside of this unit. Appears to be a very old building that has been divided into many units. A floorplan should be shown for all of the homes. Where are the stairs coming from downstairs, does the loft have windows, is there a refrigerator, how many units are in the building, is there any private outdoor space? So many questions that can’t be seen in these pictures. I like what is shown but would like to always see the complete home, not just part of it. Looks more like a terrace house converted than a cottage. I’m thinking along the lines of housing ala Coronation Street. @Stephen Cass… you think UK prices are ludicrous? Try New Zealand where the Government in its complete and utter stupidity is allowing anybody with money (read Chinese & Russian criminals) into the country. Chinese purchasers especially are buying up at massively over the top amounts because they “want” houses that will be useful as boltholes when the Chinese collapse occurs. And it will, just a matter of time. Current prices in Auckland, our largest city, are in the region of 10x the average purchasers income. Latest stats I saw showed average price, and it is climbing, is $NZ 820,000. Peanuts when you have many hundreds of millions of dollars, or more. We are being made tenants in our own country. Thanks to our Prime Minister and his cronies. Telling that he used to work for Merrill Lynch and “earned” the nickname of the Smiling Assassin. This house in in Rawdon, a village towards the north of Leeds. Not a lot of Russian drug money going into properties in this area! This is a terraced cottage or possibly a back to back terrace – it’s not clear from the description. All the windows are to the front and there is no back garden, so it could be a back to back house. Yorkshire has many homes like this, stone or brick built. They were built to house workers in the 19th Century. This is a 3 storey house – many have a cellar as well. Rawdon is a nice area, with good schools and easy access to Leeds and Bradford, so prices are quite high. It would be more expensive in a pretty Yorkshire Dales village or coastal area.